Create a checkbox that can toggle between two values of a State when checked/unchecked. Attach a state to a checkbox using the Attached State field. The checkbox is automatically selected (checked) when the state has the “active” value. Clicking the checkbox to select it will set or unset the “active” value accordingly. “Active” Value The state value to activate when this checkbox is selected (i.e. checked). This should be the value’s number, rather than its name. For example, for the “ON” value of a state that has two values, “OFF (1)” and “ON (2)”, use 2. 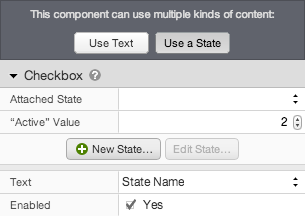 Text A state-based checkbox can update its text automatically based on the attached state. You can choose to display the name of the attached state or the name of the “active” value. You can also choose not to display any text next to your checkbox. This can be useful if you wish to use a separate component for the label.